An impressive and colossal han with a plan unlike any other han in Anatolia, and located in a setting of stunning beauty and history. The Evdir Han is located 18 km from Antalya in the Uzunkuyu region, on the Antalya-Burdur road. It is situated in the Yeşilbayir neighborhood of the Döşemealti district. It is two km off the main road. 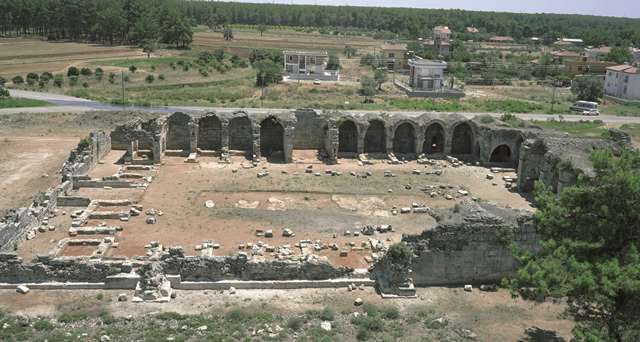 The han is built on the ruins of the ancient city of Termessos. The Termessos, Doyran and the Çiğlik Mountains are situated to the west of the han. The modern road retraces the old caravan route which continues to the west through the valley between the mountain ranges. The han is now surrounded by modern buildings, but it does not take much imagination to dissolve them away and consider how this lone sentinel of a han must have dominated this impressive setting when it was built. This was the first han along on the road going north from Antalya on the Seljuk road leading from Antalya north across the mountains. The old Seljuk route was at the foot of the mountains and continued northwards. The next han is the Kirkgöz Han. Research has revealed the existence of three additional hans along this route: the Küçük Yenice Han, the Büyük Yenice Han and the Tahtali Beli Han. The road bifurcates after the Evdir Han, with one branch leading west to Korkuteli and the other north to the Kirkgöz Han. It is to be noted that a cluster of hans was built at a relatively short distance between each. 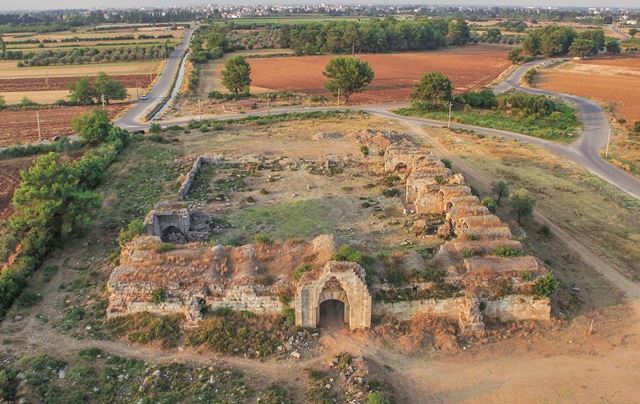 This han is located but a short distance from the city center of Antalya, and 16 km past this han in the direction of Burdur is a second han, the Kirkgöz Han. The Küçük Yenice and Büyük Yenice Hans, the next stations on this route, are also a mere 16 kilometers away from the Evdir Han. A caravan has the potential of covering a distance of 40km per day give or take, depending on topographic and weather conditions. Why this cluster of hans was built so close to each other remains an unresolved issue. There are several possible explanations: perhaps these hans were built at different periods, perhaps they were built on routes that were used in different periods, or perhaps some were built for other uses, such as military posts or palaces. At the time of its construction it was the largest han in Anatolia. 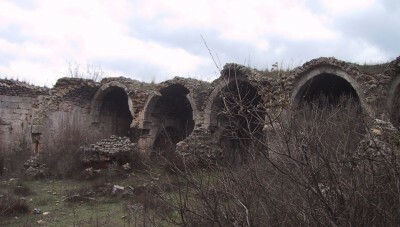 The han is also known as the “Korkuteli Han” because it is very close to the Korkuteli District. It has not been possible to determine the origin of the name of this han, as the travelers who visited the han have called it different names in their travel journals. One of the oldest descriptions of the han was made by Ritter, who, without mentioning its name, stated that the han is a square-planned, large han and that its courtyard is surrounded by two arches and its “crown door is as beautiful as the architecture of the Antalya (Adalya) Castle, and that it was built in the Saracenic style”. Other travelers who have left descriptions of the han were Ritter, Schönborn, Corancez, Spratt, Forbes, Hall, Rott, Hirschfeld and Texier. Several of these mention a Güllik Han, whose location is not know today. Antalya was recaptured by Izzeddin Keykavus I in 1216. It is roughly contemporary with the hospital he founded in Sivas. It is apparently one of the oldest dated caravanserais. An inscription, now lost but seen by Rudolf Riefstahl in 1928, states that the han was built by Izzeddin Kaykavus I (r. 1201-19). Riefstahl was the first to read some parts of the inscription of three lines and published his translation in 1931. The inscription over the crown door in 1940 was published by Fikri Erten. This inscription was later removed and taken to the garden of the school of the Yeşil Bayir village, but has since gone missing. Cemazilevvel (the fifth lunar month) 1 (year six hundred) … ten. 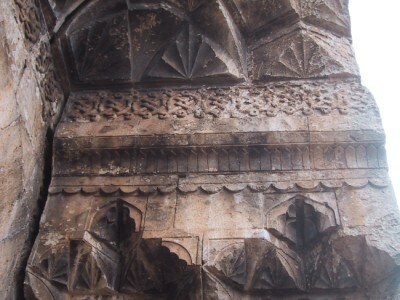 The number 1 noted in the inscription is assumed to represent 10 (ten) and, thus, the han would have been built between the years Hijri 608-616, or 1211-1220, during the reign of Sultan Izzeddin Keykavus. 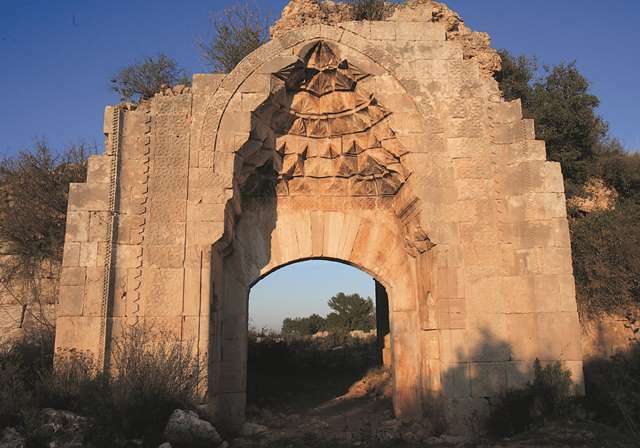 Built of finely-cut smooth-faced stone, this han is part of the group of hans connecting the city of Antalya, captured by the Seljuks in 1207, to the capital of Konya. The next han north is the Kirkgöz Han. The han is built on a slightly inclined terrain on a north-south axis. The entrance faces south. The entry to the han is through a crown door on the south side – and what a spectacular one it is, offering a stunning view onto the valley below. The southern side is the best preserved part of the building, with a large portion of the vaulting system still standing and the perimeter almost in its original height. The northern side has mostly collapsed down to a few courses of masonry. This han has a very unusual plan; in fact, it is unique among all Anatolian hans. It comprises a plan with four iwans leading into a wide, central courtyard. Although this 4-iwan han plan is not seen in Anatolia, it was quite common in many regions of Central Asia and Iran. 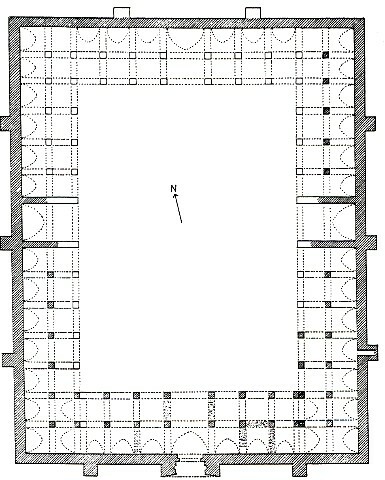 Hans with this type of plan are described as having the “central room plan with four iwans”. The origin of the central room plan in hans can be traced to the civilizations of the Indus valley and Mesopotamia. This iwan plan was seen in Mesopotamia at Dura Europos, dated to the 2nd century BC, which rests, for the moment, as the oldest known example. The development of the courtyard and iwan, which are the basic elements of this plan type and which provide access to the central courtyard from four main directions, occurred in the Parthian and Sasanian periods in the regions of Central Asia and Iran. 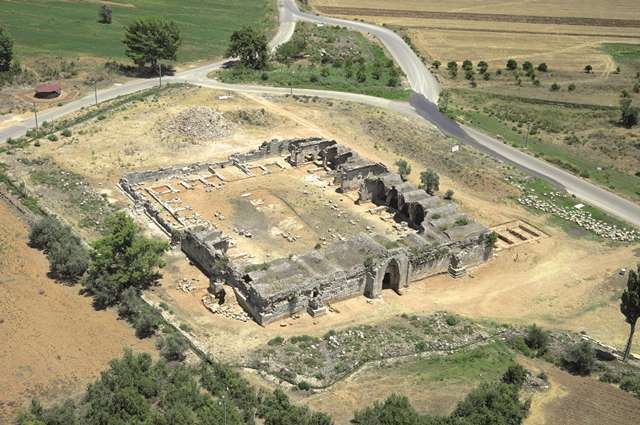 Palaces built with iwans were a tradition of the Sassanid Kings in this period. Hans such as the Ode Mergan Caravanserai, Ribat-i Mah, Ribat-i Anushirvan, Daya Khatun Ribat and Ribat-i Şerif are some examples of the many caravanserais built using this plan type in Central Asia and Iran. After the Great Seljuk period, many hans were built using this same plan in the Ilkhanid and Safavid periods. The iwan-centered layout scheme developed in the Islamic period as well, when it was used especially in both religious and civil structures. Caravanserais with this plan type were also built in Syria. Riefstahl states: “It represents a type of medieval han known outside of Anatolia but representing the first Seljuk example observed in Anatolia. This plan existed in smaller Roman castles of Syria, the ribats of North Africa and the Great Seljuk era hans of Persia and Iraq.” This plan is also seen in Anatolia also at the Evdir and Kirkgöz Hans. There is no evidence to indicate whether this plan type was being used in Anatolia before the arrival of the Seljuks. 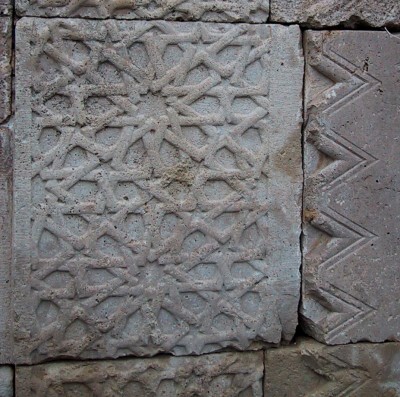 The information currently known is not sufficient to explain the reason why this plan type, which originated in Central Asia and Iran and which was commonly used in ribat and caravanserais, was seen in only one example in Anatolia: the Evdir Han in Antalya. Due to the warmer climate of the Antalya region, changes were made in the original han plan, with a more extensive open area for the courtyard. Due to the mild climate of this region, a covered section is not necessary. This large courtyard is surrounded by a double cloister-like arcade, with reduced enclosed space for shelter. There are observation holes in the slightly pointed arches where the animals were tied and cargo was unloaded. There are 14 cells each on the eastern and western sections, and 11 cells each on the northern and southern sections. The cells have slightly pointed arch vaults running toward the center of the courtyard, supported by arcades, which in their turn consist of two pointed arches. The eighth arcades of the western and eastern sides are wider than the others and form a sort of transversal axis to the plan. 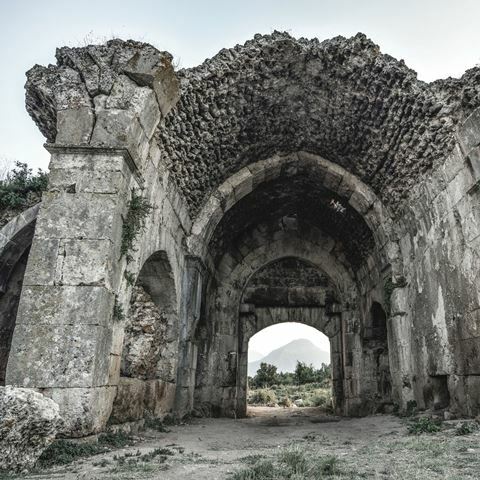 The arcades are of the typical Seljuk form, with slightly pointed arch vaults running toward the center of the courtyard, supported by arches, which in turn consist of two-pointed arches. In the Evdir Han, the iwans have vaults and the rooms between the 4 iwans open directly onto the courtyard. The arcade sections, located between the iwans, are covered with pointed vaults carried on piers between two support lines in the direction of the courtyard. The section of the courtyard from the first support line until the second support line is designed as a loading platform. The section at the end of the platform is built at a lower level, and was the area reserved for tethering animals. This feature renders this han unique among the caravanserais built in the Seljuk period in Anatolia. In the 3rd arcade north of the main entrance are stairs leading up to the roof, used as sleeping accommodation. In the third arcade of the south wing is an entrance into the wall, which may have led to a cistern or which may have been a toilet or hamam. It is believed that the buttress on the western side was used as a latrine. The courtyard of this han is of impressive dimensions. Due to the size of its court, it is tempting to consider it as a sultan han, which would make it the second oldest one in existence. The courtyard is surrounded by open arcades on all four sides. There is symmetry on both axes of the han, with an iwan in the middle of each side. The exterior walls of the han are braced by three support towers on the east and west sides, including two support towers which contain latrines and staircases, and two square support towers each on the north and south sides. The support tower on the southeast contains a latrine accessed by a narrow corridor. Its discharge channel has survived intact. There are no traces of drain spouts on the roof. Although there is no designated space for a mosque in this han. The mosque may have been located in the eastern iwan on the long side of the courtyard, in the larger 8th arcade, although no traces of a mihrab can be found anywhere in the arcaded cells. 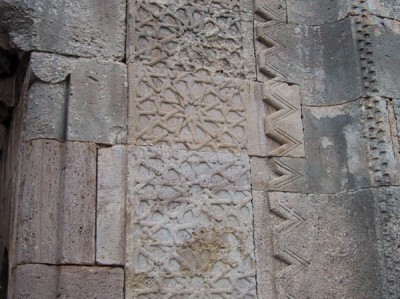 There is a staircase to the west of the entrance which suggests the application of placing a mosque on the upper level, as is commonly seen in Seljuk hans. However, this staircase does not appear large enough for such a function. One of the covered rooms near the entrance, or, one of the iwans could have been used as the mosque. The loading platform is visible between the first and second piers of the southern section. Between the wall and second support line is reserved for tethering animals. A latrine is located inside one of the support towers on the south wall of the iwan. The toilet stone slab and pieces of the water installations are still visible. No bath has been noted, although a small stream runs to the west of the han. There are some rubble ruins there which could have been a cistern, as was reported by Riefstahl. this cistern is located southwest of the han and has four long barrel vaults, entered by a flight of steps leading underground. This cistern must have been fed from a surrounding canal. In addition, the structure in the southwest corner of the han, designated by Texier as a cistern, could, in fact, be the baths, according to some researchers. The walls of the han were made of reuse spolia materials gathered from the ancient city of Termessos which surrounded the han. The spolia material was set in their original form in some places by following the same orientation they would have followed originally. These spolia pieces, especially the architraves set into the walls, are significant. The vaults comprising the roof of the han were made of pitch-faced stone, and, according to the existing traces, it appears that the vault surfaces were plastered. Numerous mason marks can be noted on the stones of the han, The walls of the han were built with the technique known as the rubble wall technique. This han not only has a very unusual plan, but it has a spectacular crown door. All the decoration is focused on this element. The portal of white limestone is ornate and imposing, and is one of the most impressive examples after those of the Sultan Hans. It contains a magnificent pointed arch, the upper cornice of which (along with the inscription plaque it contained) is now destroyed. The hood is filled with seven rows of muqarnas. The pointed arch of the entry portal faces south towards the mountains. There are 2 closed rooms on each side of the entryway passage, probably used for service needs. The richly-decorated Evdir Han portal has suffered losses to the upper section and may well have originally featured a lion sculpture as well. 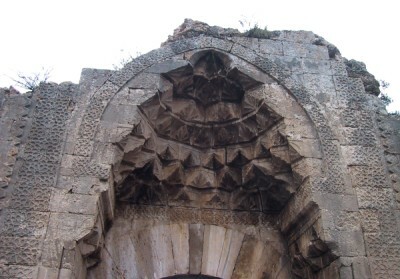 The muqarnas hood of the Evdir Han has a very angular appearance, more so than in other hans. It is to note that this portal is one of the rare ones that does not have joggled voussoirs. Although the Evdir Han voussoirs are totally plain, the keystone being the narrowest of all the voussoir stones is uncommon. The crown door, which projects from the front wall, is surrounded with six borders, two of which are plain and the others have different geometric patterns. The next border, slightly recessed, comprises a composition of 16-pointed stars in its center. A space after this border connects to the headings of the semi-circular columns in the corners. The decorative program of the gateway portal is elaborate. The Evdir Han wears this magnificent portal like a crown. Starting at the walls working inwards, it contains 4 distinct elements joined together. First there is an outer band of clean-hewn stones, linked to a curved molding by a crisp strip of dogtooth ornament. It is completed by majestic broad side panels with a stunning fretwork pattern of interlaced stars bordered by running triangles, a motif seen on the crown doors of the Sari and Ağzikara Hans. On the interior side faces of the entry porch, another fine decorative program assembles a series of 5 sculptural elements: a pair of stalactite arches, a row of scallops, a curved molding with lappets, a fretwork frieze of ropelike interlaced elements, finally crowned by 3 half palm fronds. The stalactite half-dome over the door is comprised of the same palm frond (or perhaps fluted shell) pattern found on the sides, and is framed by a curved band of fretwork stars forming a pointed arch. 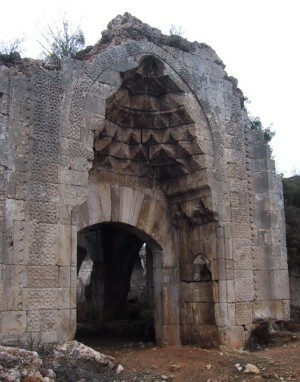 The main opening of the crown door is comprised of a recessed arch of flat stones, above which is a pointed arch with parallel edges joined at the corners, which is not a common feature in Seljuk stone decoration. The parts above the arch have collapsed and its stone pieces are lost. According to sources, there once was an inscription here. The crown door opening is surmounted with seven rows of muqarnas, filled with palm fronds in the shape of scalloped shells at the corners. A semi-circular niche, crowned with a hood with 3 rows of muqarnas, is located on each side of the inner sides of the crown door. 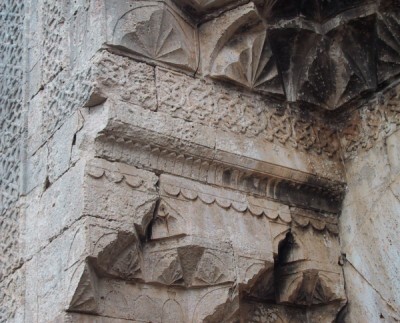 At the top of these niches is a console composed of three lines of muqarnas, designed as two separate sections and which support the profiled moulding above the crown door opening. There is a buttress on each side of the crown door, in the axis of the arcade arch supporting the wall. This is a major decorative program for a portal, which would give weight to the hypothesis that it is a sultan han. Total area: 3,800m2, which makes it the third largest of all Seljuk hans. Its utilitarian nature is very evident, as the rectangular courtyard is so large it resembles a military campground. Today the han stands empty, and in a fairly ruined state. The southern section of the han is in better condition than the northern section, which is almost completely destroyed down to the foundation level. Two-thirds of the eastern walls have collapsed, and only the wall inside the arch of the western wall has remained standing. On the eastern wing of the courtyard, the walls of the central iwan are standing up to the roof vault. The vaults on the south side of the courtyard, from the outside bearing walls to the second leg line, are partly solid, whereas those of the first support line facing the courtyard have completely collapsed. The eastern and and southern walls are half-standing, half of the western section is missing, and the northern section is completely destroyed. Despite its ruined state, the plan and structure are very easy to determine. The interior of the han and its surroundings were covered with thick brush until recently. Most of the walls were covered with soil. 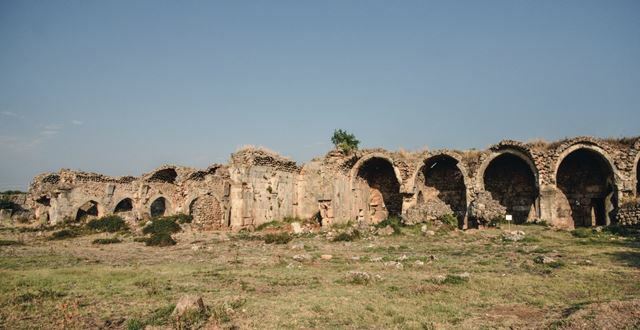 An archeological excavation for repairing and cleaning the han was carried out under the supervision of the Art History and Architecture Department of Akdeniz University in 2015-2016. After this work, the interior and the environment of the han became more apparent. The view of the Termessos mountains through the entry door is breathtaking. Its size, remote location and imposingly elegant door all join to make this an unforgettable han to visit. Acun, H. Anadolu Selçuklu Dönemi Kervansarayları, 2007, pp. 418-433 (includes extensive bibliography in Turkish), p. 456. Altun, Ara. An Outline of Turkish Architecture in the Middle Ages, 1990, p. 198. Bektaş, Cengiz. Selçuklu kervansarayları, korunmaları ve kullanılmaları uzerine bir öneri, 1999, pp. 69-71. Corancez, Louis-Alexandre de. Itinéraire d’une partie peu connue de l’Asie Mineure, 1816, pp. 391-392. Demir, Ataman. "Anadolu Selçuklu Hanlari. Evdir Han", Ilgi, 53 (1988), pp. 13-17. Demir, Ataman. "Anadolu Selçuklu Hanlari. Kirkgöz Han", Ilgi, 54 (1988), pp. 17-20. Eravşar, O. "Anatolia-Syria Caravan Road and Menzil Caravanserais in the 13th century". ARAM, University of Oxford Oriental Institute, 2007, p. 425. Eravşar, Osman. Yollarin Taniklari (Witnesses of the Way), 2017, p. 29, p. 68, pp. 535-547. Eravşar, Osman. “Evdir Hanı” in Acun, Hakki, ed, Anadolu Selçuklu Dönemi Kervansarayları. Ankara, Kültür Bakanlığı, 2007, pp. 418-433 (includes bibliography). Erdmann, Kurt. Das Anatolische Karavansaray des 13. Jahrhunderts, 1961, pp. 175-178, no 55; vol. 3, pp. 121-122. Erten, F. Antalya Vilayet Tarihi. Istanbul, 1940, p. 76. Ertuğ, Ahmet. The Seljuks: A Journey through Anatolian Architecture, 1991, p. 78. Görür, Muhammet. “Anadolu Selçuklu Dönemi Kervansaraylari Kataloğu.” Acun, H. Anadolu Selçuklu Dönemi Kervansaraylari. Ankara: Kültür ve Turizm Bakanliği, 2007, p. 498. Hillenbrand, R. Islamic Architecture: Form, function and meaning, 1994, fig. 6.51, p. 553. Karpuz, H. & Kuş, A. & Dıvarcı, I. & Şimşek, F. Anadolu Selçuklu Eserleri, 2008, vol. 1, p. 130. Kuban, D. Selçuklu Cağinda Anadolu Sanati, 2002, p. 240. McClary, Richard P. Rum Seljuq Architecture 1170-1220: The Patronage of Sultans. Edinburgh: Edinburgh University Press, 2016, p. 68, 70, 74, 75, 86. Ögel, S. Anadolu Selçuklularin Taş Teyzinati, 1966. Özergin, M. Kemal. “Anadolu’da Selçuklu Kervansarayları”, Tarih Dergisi, XV/20, 1965, pp. 149, n. 36. Riefstahl, R. Meyer. Turkish Architecture in southwestern Anatolia, 1931, pp. 62-64; 90; ill. 114-116. Ritter, C. Kleinasien: teil 1: Erdkunde von Asien, 1858-59, V.19. p. 671. Schönborn, Julius Augustus. Einige Bernerkungen über den Zug Alexanders durch Lycien und Pamphylien, 1849, p. 93. Spratt, T.A.B. & Forbes, E. Travels in Lycia, Milyas and the Cibryatis, 1847, V. I, pp. 226-227; 230-231. Taşkiran, Zehra Fürüzan. “Antalya Çevresinde Yer Alan Selçuklu Hanlarindan Evdir Han ve Kirkgöz Han.” Antalya I. Selçuklu Eserleri Semineri, 22-23 Mayis, 1986, Antalya Valiliği. Antalya, 1986. Tavernari, Cinzia. “Stones for Travellers: Notes on the Masonry of Seljuk Road Caravanserais”. In Blessing, Patricia and Rachel Gosgarian, eds. Architecture and Landscape in Medieval Anatolia, 1100-1500. Edinburgh, 2017, pp. 64-68, fig. 3.1, pl. 4. Ünal, Rahmi Hüseyin. “Doğu Anadolu’da Bilinmeyen Üç Selçuklu Hani.” Arkeologi-Sanat Tahrihi Dergisi, II, 1983.